The Rideau Canal, also known unofficially as the Rideau Waterway, connects Canada's capital city of Ottawa, Ontario, to Lake Ontario and the Saint Lawrence River at Kingston, Ontario. It is 202 kilometres in length. The name Rideau, French for "curtain", is derived from the curtain-like appearance of the Rideau River's twin waterfalls where they join the Ottawa River. The canal system uses sections of two rivers, the Rideau and the Cataraqui, as well as several lakes. The Rideau Canal is operated by Parks Canada. The canal was opened in 1832 as a precaution in case of war with the United States. It remains in use today primarily for pleasure boating, with most of its original structures intact, operated by Parks Canada. The locks on the system open for navigation in mid-May and close in mid-October. It is the oldest continuously operated canal system in North America, and in 2007 it was registered as a UNESCO World Heritage Site. 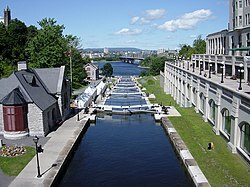 The construction of the Rideau Canal was a preventive military measure undertaken after a report that during the War of 1812 the United States had intended to invade the British colony of Upper Canada via the St. Lawrence River, which would have severed the lifeline between Montreal and Kingston. The British built a number of other canals (Grenville, Chute-à-Blondeau and Carillon Canals, all along the Ottawa River) as well as a number of forts (Citadel Hill, La Citadelle, and Fort Henry) to impede and deter any future American invasions of Canadian territory. The initial purpose of the Rideau Canal was military, as it was intended to provide a secure supply and communications route between Montreal and the British naval base in Kingston. Westward from Montreal, travel would proceed along the Ottawa River to Bytown (now Ottawa), then southwest via the canal to Kingston and out into Lake Ontario. The objective was to bypass the stretch of the St. Lawrence bordering New York; a route which would have left British supply ships vulnerable to an attack or a blockade of the St. Lawrence. The canal also served a commercial purpose. The Rideau Canal was easier to navigate than the St. Lawrence River because of the series of rapids between Montreal and Kingston. As a result, the Rideau Canal became a busy commercial artery from Montreal to the Great Lakes. However, by 1849, the rapids of the St. Lawrence had been tamed by a series of locks, and commercial shippers were quick to switch to this more direct route. The construction of the canal was supervised by Lieutenant-Colonel John By of the Royal Engineers. Private contractors such as future sugar refining entrepreneur John Redpath, Thomas McKay, Robert Drummond, Thomas Phillips, Andrew White and others were responsible for much of the construction, and the majority of the actual work was done by thousands of Irish and French-Canadian labourers. Colonel John By decided to create a slackwater canal system instead of constructing new channels. This was a better approach as it required fewer workers, was more cost effective, and would have been easier to build. The canal work started in the fall of 1826, and it was completed by the spring of 1832. The first full steamboat transit of the canal was done by Robert Drummond's steamboat, Rideau (aka "Pumper"), leaving Kingston on May 22, 1832 with Colonel By and family on board, and arriving in Bytown on May 29, 1832. The final cost of the canal's construction was £822,804 by the time all the costs, including land acquisitions costs, were accounted for (January 1834). Given the unexpected cost overruns, John By was recalled to London and was retired with no accolades or recognition for his tremendous accomplishment. Once the canal was constructed, no further military engagements took place between Canada and the United States. Although the Rideau Canal never had to be used as a military supply route, it played a pivotal role in the early development of Canada. Prior to the locks being completed on the St. Lawrence in the late 1840s, the Rideau served as the main travel route for immigrants heading westward into Upper Canada and for heavy goods (timber, minerals, grain) from Canada's hinterland heading east to Montreal. Tens of thousands of immigrants from the British Isles travelled the Rideau in this period. Hundreds of barge loads of goods were shipped each year along the Rideau, allowing Montreal to compete commercially in the 1830s and 40s with New York (which had the Erie Canal) as a major North American port. In 1841, for instance, there were 19 steamboats, 3 self-propelled barges and 157 unpowered or tow barges using the Rideau Canal. As many as one thousand of the workers died during the construction of the canal. Most deaths were from disease, principally complications from malaria (P. vivax), which was endemic in Ontario within the range of the Anopheles mosquito, and other diseases of the day. Accidents were fairly rare for a project of this size; in 1827 there were seven accidental deaths recorded. Inquests were held for each accidental death. The men, women and children who died were buried in local cemeteries, either burial grounds set up near work sites or existing local cemeteries. Funerals were held for the workers and the graves marked with wooden markers (which have since rotted away—leading to a misconception that workers were buried in unmarked graves). Some of the dead remain unidentified as they had no known relatives in Upper Canada. Memorials have been erected along the canal route, most recently the Celtic Cross memorials in Ottawa, Kingston and Chaffeys Lock. The first memorial on the Rideau Canal acknowledging deaths among the labour force was erected in 1993 by the Kingston and District Labour Council and the Ontario Heritage Foundation at Kingston Mills. Three canal era cemeteries are open to the public today: Chaffey's Cemetery and Memory Wall at Chaffey's Lock—this cemetery was used from 1825 to the late 19th century; the Royal Sappers and Miners Cemetery (originally called the Military and Civilian Cemetery and then as the Old Presbyterian Cemetery) near Newboro—used from 1828 to the 1940s; and McGuigan Cemetery near Merrickville—used from the early 19th century (c. 1805) to the late 1890s. The Rideau Canal was designated a National Historic Site of Canada in 1925, and marked with a federal plaque the next year, and again in 1962 and 2013. The canal has been featured on postage stamps issued by Canada Post. Two 45-cent stamps—'Rideau Canal, Summer Boating at Jones Falls' and 'Rideau Canal, Winter Skating by Parliament'—were issued on June 17, 1998, as part of the Canals and Recreational Destinations series. The stamps were designed by Carey George and Dean Martin, based on paintings by Vincent McIndoe. In 2014, the canal appeared on a $2.50 international rate stamp as part of a Canada Post set honoring World Heritage Sites. The same design was reprised on a 2016 domestic-rate stamp. Looking up from the bottom of the Ottawa Lockstation of the Rideau Canal. Chateau Laurier in Center rear. In 2000 the Rideau Waterway was designated a Canadian Heritage River in recognition of its outstanding historical and recreational values. In 2007 it was inscribed as a UNESCO World Heritage Site recognizing it as a work of human creative genius. The Rideau Canal was recognized as the best preserved example of a slack water canal in North America demonstrating the use of European slackwater technology in North America on a large scale. It is the only canal dating from the great North American canal-building era of the early 19th century that remains operational along its original line with most of its original structures intact. It was also recognized as an extensive, well preserved and significant example of a canal which was used for military purposes linked to a significant stage in human history – that of the fight to control the north of the American continent. A plaque was erected by the Ontario Archaeological and Historic Sites Board at Jones Falls Lockstation commemorating Lieutenant Colonel John By, Royal Engineer, the superintending engineer in charge of the construction of the Rideau Canal. The plaque notes the 123-mile-long (198 km) Rideau Canal, built as a military route and incorporating 47 locks, 16 lakes, two rivers, and a 360-foot-long (110 m), 60-foot-high (18.3 m) dam at Jones Falls (Jones Falls Dam), was completed in 1832. Other plaques to the canal erected by the Ontario Heritage Trust are at Kingston Mills, Smiths Falls, and Rideau Lakes. The 202 kilometres (126 mi) of the Rideau Canal incorporate sections of the Rideau and Cataraqui rivers, as well as several lakes, including the Lower, Upper and Big Rideau lakes. About 19 km (12 mi) of the route is man-made. Communities along the waterway include Ottawa, Manotick, Kars, Burritts Rapids, Merrickville, Smiths Falls, Rideau Ferry, Portland, Westport, Newboro, Seeleys Bay and Kingston. Communities connected by navigable waterways to the Rideau Canal include Kemptville and Perth. Since World War I and the construction of more extensive rail lines into rural Ontario, only pleasure craft make use of the Rideau Canal. It takes 3–5 days to travel one way through the Rideau Canal system by motor boat. Boat tours of the canal are offered in Ottawa, Kingston, Merrickville, and Chaffeys Lock. A cruise line operates the ship Kawartha Voyageur. Recreational boaters can use it to travel between Ottawa and Kingston. Most of the locks are still hand-operated. There are a total of 45 locks at 23 stations are along the canal, plus two locks (locks 33 and 34) at the entrance to the Tay Canal (leading to Perth). Furthermore, there are four blockhouses and some of the original 16 defensible lockmasters residences along the waterway. The original Commissariat Building and foundation of the Royal Engineers' barracks remain at the Ottawa Lock Station. The waterway is home to many species of birds, reptiles, amphibians, mammals and fish. In 1973–74 a new Smiths Falls Combined Lock, 29a, was built a few dozen metres to the north of the original flight of three locks (locks 28–30). The original locks were bypassed but left in place. The Rideau Canal uses a lock system that is still fully functioning. The gates that let boats in and out of the locks last approximately 12–15 years. When the canal was constructed, the gates were made at the lock sites by carpenters and blacksmiths, but presently they are made in Smiths Falls, Ontario, and sometimes take up to 2 months to build 1 set of gates. The gates used on the Rideau Canal are made of Douglas Fir and are mitre-shaped to ensure a tight seal due to water pressure. The average Rideau Canal lock lift uses 1.3 million litres (1,300 m3; 1,700 cu yd) of water. In normal operations the canal can handle boats up to 27.4 m (89 ft 11 in) in length, 7.9 m (25 ft 11 in) in width, and 6.7 m (22 ft) in height with a draft of up to 1.5 m (4 ft 11 in) (boats drafting over 1.2 m (3 ft 11 in) are asked to contact the Rideau Canal Office of Parks Canada prior to their trip). In special circumstances a boat up to 33.5 m (109 ft 11 in) in length by 9.1 m (29 ft 10 in) in width can be handled. Newboro Blockhouse – built by the British Ordnance Department, it was also used briefly for its intended military role in the 1830s and then converted to home for lockmaster; restored in 1960s to original blockhouse configuration. Rideau Narrows Blockhouse – built by William H. Tett it was also altered in the 19th century to become lockmaster's residence and restored from 1967 to 1970 to its original layout. A fifth blockhouse at Burritts Rapids was partially built in 1832 before work was stopped with only the foundation and walls completed, then rebuilt in 1914–1915 and finally demolished to be replaced by the current lock station in 1969. Parliament Hill was intended to be the site of a fortress, to be called Citadel Hill, where the canal ended at the Ottawa River. The Rideau Canal Skateway, with the Chateau Laurier in the background. 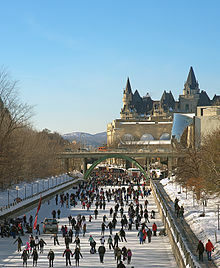 In winter, a section of the Rideau Canal passing through central Ottawa becomes officially the world's largest and second longest skating rink. The cleared length is 7.8 kilometres (4.8 mi) and has the equivalent surface area of 90 Olympic ice hockey rinks. It runs from the Hartwell locks at Carleton University to the locks between the Parliament Buildings and the Château Laurier, including Dow's Lake in between. It serves as a popular tourist attraction and recreational area and is also the focus of the Winterlude festival in Ottawa. Beaver Tails, a fried dough pastry, are sold along with other snacks and beverages, in kiosks on the skateway. In January 2008, Winnipeg, Manitoba, achieved the record of the world's longest skating rink at a length of 8.54 kilometres but with a width of only 2 to 3 metres wide on its Assiniboine River and Red River at The Forks. In response, the Rideau Canal was rebranded as "the world's largest skating rink". The Rideau Canal Skateway was added to the Guinness Book of World Records in 2005 for being the largest naturally frozen ice rink in the world. The Skateway is open 24 hours a day. The length of the season depends on the weather, but typically the Rideau Canal Skateway opens in January and closes in March. In 1971–1972, the Skateway's second winter, the skating season was 90 days long, which is the longest season so far. 2015–2016 was the shortest Rideau Canal Skateway season, being a mere 34 days long (and with only 18 skating days). Although some residents of Ottawa used the canal as an impromptu skating surface for years, the official use of the canal as a skateway and tourist attraction is a more recent innovation. As recently as 1970, however, city government of Ottawa considered paving over the canal to make an expressway. The federal government's ownership of the canal, however, prevented the city from pursuing this proposal. When Doug Fullerton was appointed chair of the National Capital Commission, he proposed a recreational corridor around the canal, including the winter skateway between Carleton University and Confederation Park. The plan was implemented on January 18, 1971, despite opposition by city council. A small section of ice near the National Arts Centre was cleared by NCC employees with brooms and shovels, and 50,000 people skated on the canal the first weekend. Today the skating area of the canal is larger because of the equipment available for ice resurfacing and 24/7 maintenance crews. The skateway now has an average of one million visits per year. City councillor and author Clive Doucet credits this transformation of the canal with reinvigorating the communities of the Glebe, Old Ottawa East and Old Ottawa South. The preparation for the Skateway starts as early as mid-October. At the end of the boating season, the water is drained at the Ottawa locks near Parliament by Parks Canada. Facilities on the ice such as shelters, chalets, and access ramps for vehicles are then installed. Next, "beams are placed at the locks, and the water is raised to skating level." After this step, the essentials are added such as stairs to access the ice, and hookups for both plumbing and electricity. The ice cap that forms as the canal freezes becomes the Rideau Canal Skateway. When the canal has built up a sufficient ice thickness, snow is removed from the ice surface and it is flooded in order to make the ice even more thick and smooth. Samples of ice are tested for quality and thickness. When it is safe to skate on, the Rideau Canal Skateway is opened for the season. The Rideau Canal Skateway is maintained by the NCC (National Capital Commission). The ice is maintained by crews 24 hours a day, seven days a week. The snow and ice shavings are cleared off the surface every day and the ice surface is flooded each night with a "water dispersion machine" (weather permitting) to fill in any cracks caused by the contracting and expanding ice. There are approximately 20 holes along the side of the Skateway that flood the ice surface to make it smoother for skaters. Two types of ice can form on the Rideau Canal Skateway, which are "white ice" and "clear ice". White ice has a milky appearance with air bubbles, and is formed when snow and water mix and then freeze. White ice can also be formed by mechanically flooding the ice surface with water to increase the thickness of the ice cap. The other type of ice is called "clear ice", which has a colourless appearance and is formed when ice crystals build up below the frozen surface in cold temperatures. If snow accumulates on the ice it can negatively impact the conditions for skating. Snow depresses the ice surface and slows down the formation of ice crystals beneath the surface. Ice conditions can be classified as very good, good, fair or poor. They are updated twice daily by the NCC. The ideal ("very good") conditions mean there are "a limited number of pressure cracks", the ice is very hard and durable overall, the ice surface is clean and smooth, there are a "limited number of rough areas", and there is a "very good gliding surface." ^ UNESCO World Heritage Centre. "Rideau Canal – UNESCO World Heritage Centre". UNESCO. Retrieved 2014-03-18. ^ "Rideau Canal Waterway – History of the Rideau Canal". Rideau-info.com. Retrieved 2013-03-03. ^ Rideau Canal, UNESCO World Heritage, UNESCO.org. Retrieved 2008-01-14. ^ "Rideau Canal National Historic Site of Canada > Lockstation Safety". Parks Canada. Retrieved 2013-11-16. ^ UNESCO names World Heritage sites, BBC News, 28 June 2007. Retrieved 2008-01-14. ^ Legget, Robert (1955). Rideau Waterway. Toronto: University of Toronto Press. pp. 23–25. ^ Roy MacGregor (7 August 2016). "The story of the Rideau Canal: A major engineering feat of the 19th century". The Globe and Mail. Retrieved 2016-08-10. ^ "Parks Canada – Rideau Canal National Historic Site of Canada Receives World Heritage Site Designation!". Retrieved 2010-05-25. ^ History of the Rideau Canal, Rideau-info.com. Retrieved 2008-01-14. ^ "Rideau Heritage Route – Environment". ^ Centre, UNESCO World Heritage. "Rideau Canal". ^ "Rideau Canal – Tales of the Rideau: Bye By – The Story of Lieutenant-Colonel John By, R.E." ^ Bush, Edward Forbes (1977). Commercial Navigation on the Rideau Canal, 1832–1961. Ottawa: Parks Canada. p. 107. ^ a b "Grave Revealed". Rideau-info.com. Retrieved 2012-03-14. ^ Memorials, Rideau-info.com. Retrieved 2008-01-14. ^ a b c "History of the Rideau Canal". Rideau-info.com. Retrieved 2012-03-14. ^ "Canada Post stamp". Data4.collectionscanada.gc.ca. 1998-06-17. Retrieved 2013-03-03. ^ Parks Canada Agency, Government of Canada (2019-02-15). "History and culture - Rideau Canal National Historic Site". www.pc.gc.ca. Retrieved 2019-03-08. ^ a b "Rideau Heritage Route – About the Rideau". Rideauheritageroute.ca. Retrieved 2014-03-18. ^ "Home page". Ontario Waterway Cruises. Retrieved 2012-04-09. ^ The Rideau Canal Waterway Frequently Asked Questions. Retrieved 2009-06-24. ^ Watson, Ken. "Friends of the Rideau – Fauna of the Rideau". ^ a b c "Parks Canada – Rideau Canal National Historic Site – Gates". Pc.gc.ca. 2012-11-02. Retrieved 2014-03-18. ^ a b "How a Lock Works" (PDF). Friends of the Rideau. Retrieved December 14, 2018. ^ "The Block House: A Rideau Canal Icon". The North Grenville Times. February 16, 2017. Retrieved December 14, 2018. ^ "A History of the Rideau Lockstations: Kingston Mills Locks 46-49". Rideau-info.com. Ken W. Watson. Retrieved December 14, 2018. ^ "Newboro Lockmaster's House with outside group". Rideau Lakes Public Library. Retrieved December 14, 2018. ^ "A History of the Rideau Lockstations: Narrows Lock 35". Rideau-info.com. Ken W. Watson. Retrieved December 14, 2018. ^ "A History of the Rideau Lockstations: Burritts Rapids Lock 17". Rideau-info.com. Ken W. Watson. Retrieved December 14, 2018. ^ "HistoricPlaces.ca - HistoricPlaces.ca". www.historicplaces.ca. Retrieved 2019-03-08. ^ "History". Bytown Museum. Retrieved 2019-03-08. ^ "The Rideau 'skateway': Not the longest, but apparently among the poshest". 18 December 2014. ^ Winnipeg lays claim to world's longest skating path. CBC News, January 27, 2008. Retrieved 1 Oct 2010. ^ a b c d e f g h i j k "The Ice | National Capital Commission". Ncc-ccn.gc.ca. 2014-02-25. Retrieved 2014-03-18. ^ "Ncc Faq". Ncc-ccn.gc.ca. Retrieved 2014-03-18. ^ "Rideau Canal – Attractions". ^ "Rideau Canal Skateway closes after shortest season on record". Canadian Broadcasting Corporation. 2016-02-25. Retrieved 2016-02-25. ^ "Well, that was quick: Rideau Canal Skateway closes for the season after 25 skating days". 2017-02-22. ^ Manchee, Janice (December 30, 2000). "Ottawa welcomes winter on the canal". Ottawa Citizen. Retrieved March 5, 2019. ^ Hughes, Graham (March 9, 2001). "Speed of snow melt, rainfall, will determine flood severity". Ottawa Citizen. Retrieved March 5, 2019. ^ Prentice, Michael (December 30, 1999). "Perfect weather for a Y2K bash". Ottawa Citizen. Retrieved March 5, 2019. ^ "Canal closed for the season". Ottawa Citizen. March 1, 2000. Retrieved March 5, 2019. ^ "Section of canal scheduled to open". Ottawa Citizen. January 2, 1999. Retrieved March 5, 2019. ^ "Skating season ends on Rideau Canal". Ottawa Citizen. March 17, 1999. Retrieved March 5, 2019. ^ "Let the skating begin". Ottawa Citizen. December 21, 1997. Retrieved March 6, 2019. ^ "Rideau Canal skate season closes early". Ottawa Citizen. March 4, 1998. Retrieved March 6, 2019. ^ "Canal opening ends long winter wait". Ottawa Citizen. January 12, 1997. Retrieved March 6, 2019. ^ "Skating ends on Rideau Canal". Ottawa Citizen. March 22, 1997. Retrieved March 6, 2019. ^ "Slip-slidin' away". Ottawa Citizen. January 3, 1996. ^ "Planning one last skate on the canal? Your chances have melted". Ottawa Citizen. February 24, 1996. Retrieved March 6, 2019. ^ "Skating on Rideau Canal". Ottawa Citizen. December 1, 1995. Retrieved March 6, 2019. ^ "Rideau Canal rink open for skaters". Ottawa Citizen. December 30, 1993. Retrieved March 6, 2019. ^ "Tennis, anyone? The canal is closed". Ottawa Citizen. March 11, 1994. Retrieved March 6, 2019. ^ "Lace 'em up". Ottawa Citizen. December 29, 1992. Retrieved March 6, 2019. ^ Small, Stephanie (March 1, 1993). "Keep canal rink open longer, say skaters, business owner". Ottawa Citizen. Retrieved March 6, 2019. ^ "Skating season closes on the Rideau Canal". Ottawa Citizen. March 7, 1992. Retrieved March 6, 2019. ^ "Canal opens today". Ottawa Citizen. January 4, 1991. Retrieved March 8, 2019. ^ "Sleet and snow create havoc". Ottawa Citizen. March 4, 1991. Retrieved March 6, 2019. ^ "Canal closes for season". Ottawa Citizen. February 24, 1990. Retrieved March 7, 2019. ^ "Canal opens for skating". Ottawa Citizen. December 23, 1988. Retrieved March 7, 2019. ^ "Meltdown: Can Spring be far behind?". Ottawa Citizen. March 15, 1989. Retrieved March 7, 2019. ^ Middleton, Janice (January 5, 1988). "Skaters herald opening of Rideau Canal". Ottawa Citizen. Retrieved March 7, 2019. ^ a b "Canal closes". Ottawa Citizen. March 8, 1988. Retrieved March 7, 2019. ^ a b Stanyar, Barbara (December 27, 1985). "Part of Rideau Canal to open for skating this afternoon". Ottawa Citizen. Retrieved March 7, 2019. ^ Knights, Rob (February 24, 1986). "Warmer weather expected, could end Rideau Canal skating". Ottawa Citizen. Retrieved March 7, 2019. ^ "Skaters don your blades, the canal's 'roughly' open". Ottawa Citizen. January 4, 1985. Retrieved March 7, 2019. ^ "Rain puts damper on canal skating". Ottawa Citizen. February 23, 1985. Retrieved March 7, 2019. ^ Hall, Chris; Wooler, Robert; Barron, Sherri (February 23, 1984). "'Victim' turns up to stop police searching canal". Ottawa Citizen. Retrieved March 7, 2019. ^ "Canal likely closed for year". Ottawa Citizen. February 27, 1984. Retrieved March 7, 2019. ^ "Skaters take to the canal". Ottawa Citizen. January 3, 1983. Retrieved March 7, 2019. ^ McAuley, Lynn (February 17, 1983). "Canal closes after one of shortest seasons". Ottawa Citizen. Retrieved March 7, 2019. ^ MacLeod, Ian (December 28, 1981). "Skaters usher in canal season". Ottawa Citizen. Retrieved March 7, 2019. ^ "Rideau Canal closes". Ottawa Citizen. February 22, 1982. Retrieved March 7, 2019. ^ "Spring-like weather ends canal skating". Ottawa Citizen. February 17, 1981. Retrieved March 7, 2019. ^ "At long last, the longest skating rink opens". Ottawa Citizen. January 2, 1980. Retrieved March 7, 2019. ^ a b c "Canal closed by NCC". Ottawa Citizen. February 22, 1980. Retrieved March 7, 2019. ^ "Warm weather ruining skating". Ottawa Citizen. February 23, 1979. Retrieved March 7, 2019. ^ "It's skating time again on the canal". Ottawa Citizen. December 29, 1977. Retrieved March 7, 2019. 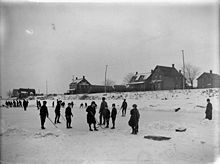 ^ "NCC halts canal skating". Ottawa Citizen. March 9, 1978. Retrieved March 7, 2019. ^ "Skating Starts". Ottawa Citizen. December 20, 1975. Retrieved March 7, 2019. ^ "Writing 'finish'". Ottawa Citizen. February 27, 1976. Retrieved March 7, 2019. ^ "Night skaters not deterred by nippy weather". Ottawa Citizen. January 3, 1975. Retrieved March 8, 2019. ^ "Canal skating over after short season". Ottawa Citizen. February 28, 1975. Retrieved March 8, 2019. ^ "Rough opening to canal season". Ottawa Citizen. January 2, 1974. Retrieved March 8, 2019. ^ "Canal season may be over". Ottawa Citizen. March 1, 1974. Retrieved March 7, 2019. ^ "Weekend skating should be super". Ottawa Citizen. December 30, 1972. Retrieved March 7, 2019. ^ "Canal skating off". Ottawa Citizen. February 26, 1971. Retrieved March 5, 2019. ^ a b c Doucet, Clive (2007). Urban Meltdown: Cities, Climate Change and Politics as Usual. Gabriola Island, BC: New Society Publishers. pp. 15–17. ISBN 978-0-86571-584-4. OCLC 86226079. ^ a b c d e f g h i "Frequently Asked Questions | National Capital Commission". Ncc-ccn.gc.ca. Retrieved 2014-03-18. ^ a b "Ice Condition Definitions | National Capital Commission". Ncc-ccn.gc.ca. 2014-02-25. Retrieved 2014-03-18. Wikimedia Commons has media related to Rideau Canal.